Successfully Added Underwater Boat Camera with Sony Super HAD CCD (10 Meters) to your Shopping Cart. Underwater Boat Camera - explore and check the surroundings of your ship comfortably seated in the cabin! This submarine camera is composed of a powerful 1/3 inch Sony Super HAD CCD chipset (420TVL) allowing you to see clear images of sea water species and ocean floor up 10 meters under your boat (a 10m cable is provided). Just plug it in a 12V AC source and a screen to admire how splendid the ocean is. 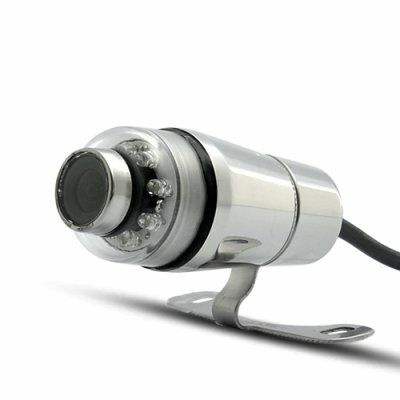 The underwater camera is also made of stainless steel giving strong resistance to natural elements and has 8 LEDs to enjoy night vision of the world of Nemo. Picture this: you are chilling on your yacht and want to take a bath to cool down your body. Ready to jump but, wisely, you have a look at the screen displaying what is under your boat. And what do you see? A luminescent yet poisonous band of jellyfishes dancing harmoniously! You have just avoided days of pain. Owner of fisherman boat: keep an eye on your fishing nets and propellers to make sure everything is alright and save time and money on repairs and maintenance. Use it also as a device to search for areas well stocked with fish. Divers: share your passion with people unable or unwilling to dive by showing them how beautiful and diversified the life is in coral reefs. Whatever you are a sailor, a rich tourist or a lover of sea, this awesome aquatic camera is a good help for viewing what is located right beneath your boat. Brought to you at an unbeatable price by the online leader of top electronic products, Chinavasion.